Lothian Thistle Hutchison Vale boss Raymond Carr insists this week’s 2-0 triumph over SPFL League Two outfit Berwick Rangers came as little surprise to anyone connected with the Capital club. Lothian secured their place in next month’s East of Scotland Cup final with a well-deserved victory over their higher league opponents as goals from Sean Wringe and a Scott Taylor-MacKenzie penalty sent the Borders club packing. 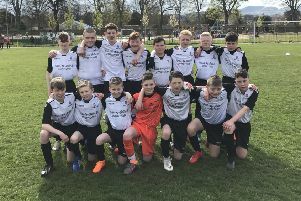 However, Carr believes his squad carry the ability to test themselves against that calibre of opposition every week despite plying their trade two divisions below in the East of Scotland League. Lothian now switch their attentions to Lowland League and Carr’s former club, Whitehill Welfare, in the fourth round of the South East Region Challenge Cup, the match having been switched to Ainslie Park tomorrow to give the surface at Saughton Enclosure some time to recover. Asked if his players’ performance in midweek had caught him off guard, Carr responded: “No, not at all. We deserved to win without a shadow of a doubt. “We’ve had a tremendous season so far and have got a right good squad. Even the Berwick supporters that had made the journey up said we were the better team and wished us luck for the final. “There are a lot of people out there who are really lazy when you look at things more closely. They don’t go looking about for players in these leagues. It’s word of mouth half the time and before you know it everyone is looking at the same player. Clubs don’t seem to want to take the gamble which just blows the mind. Lothian await the winners of the other semi-final tie between city rivals Spartans and Edinburgh City but Carr didn’t shun the opportunity when asked who he would prefer to play. “We’re already playing Spartans in a final (Football Nation Qualifying Cup next Sunday) so I’d like to face Gary’s (Jardine) lot. I know a lot of their guys so it would be good to get somebody different. We’re not too far behind these teams, maybe facility-wise but certainly not on ability. Meanwhile, Whitehill captain Steven Manson says he is only too aware of the threat Lothian pose to their chances of silverware this season. “Lothian have already shown they are a good side with their results in their league and they’ve already beaten a few Lowland teams this season as well,” he said. “They are good enough to compete in our league so we’re taking nothing for granted. Edinburgh University welcome divisional rivals Cumbernauld Colts to East Peffermill in their fourth-round tie whilst Tynecastle visit East Stirlingshire. Bottom side Preston Athletic host Gretna 2008 on league business and Civil Service Strollers entertain Vale of Leithen at Christie Gillies Park. Spartans are at Hawick.